When I was asked to review the Razer Raiju Ultimate I expected a run-of-the-mill third-party controller with a few extra buttons on it. My frame of reference only included the Xbox One Elite Controller, which I’ve been gaming on for almost 3 years now. Let’s just say I wasn’t ready for something like this. The Raiju Ultimate takes the quality I’ve come to know in the Xbox Elite Controller and throws it on steroids. Everywhere I looked, Razer had improved upon a core feature or had shown their attention to an extra layer of detail I didn’t even know I wanted in a controller. Though the carrying cases they come in are very similar, what’s inside them is not. The way the two consoles handle “elite” controllers has been different for a while now: Xbox’s Elite controller has stood as an officially licensed product which has led a lot of gamers to use it as their go-to. Scuf did introduce an Xbox Elite controller competitor, but that’s about all the choice you have on Xbox. 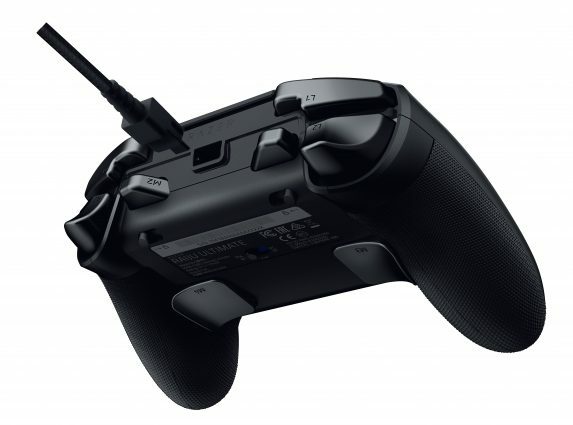 On PS4, however, Sony hasn’t designed one be-all-end-all elite controller and that has opened the market up to companies like Scuf and Razer to compete on a more level playing field. I feel like this is–in some way–because Sony doesn’t want to officially license a product that will have to have the body of an Xbox controller, but who knows. 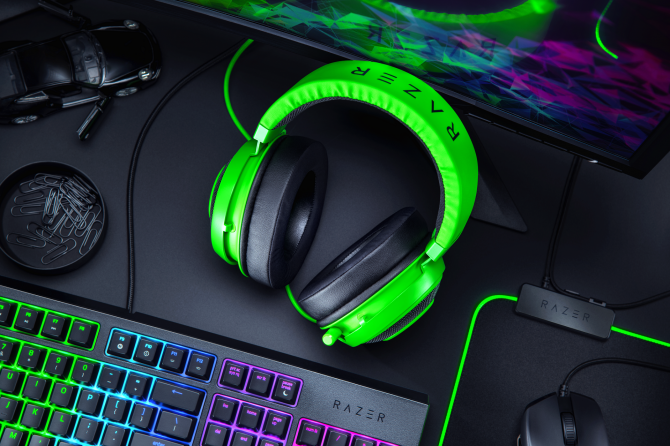 Razer’s soft migration into the console market has seen its share of wired controllers and headsets. Now the Raiju Ultimate has Bluetooth connectivity (thank god), but what’s more is that this Bluetooth allows you to switch seamlessly between PC and PS4 via a switch on the back of the controller. Flipping that switch changes the connectivity so that you don’t have to re-sync everytime you switch stations. You can also go wired if you prefer the peace-of-mind that comes with not having to charge all the time and the faster response rate. Flipping the controller over you’ll find that (surprise) it has Chroma. 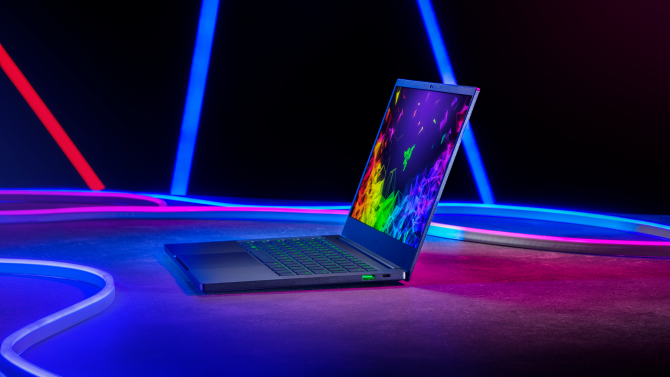 Now I’ve come to expect Chroma on just about every Razer product so this isn’t as much of a surprise as it is a bonus to going with Razer’s controller. 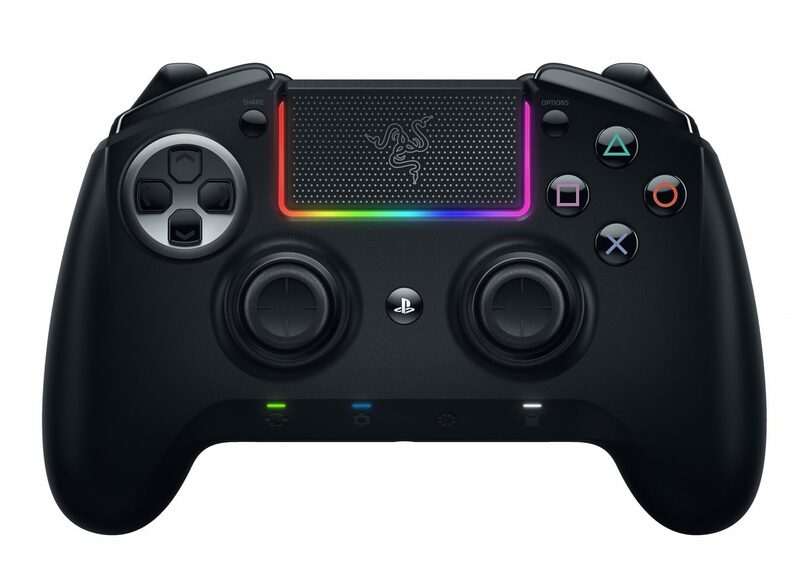 It outlines the PS4 touch button, which has the Razer logo embossed on it as well. You can change the Chroma settings right there on the bottom of the controller with soft-press buttons that are built into the body of the Raiju. The location and feel of these buttons is so important considering you’ll be pressing them anytime you want to switch button profiles or change the controller’s sensitivity or even the amount of rumble you want (though I always turn rumble off on any controller to preserve battery life). This UI they’ve created right on the controller to be able to fine-tune the Raiju Ultimate to any one person’s liking. I created a button profile for Marvel’s Spider-Man and another one for Black Ops 4. They even had different Chroma lighting to remind me which profile I was in. If you do play a lot of FPS games, the Raiju Ultimate also has hair-trigger options which you can enable by sliding a button next to the trigger. Speaking of FPS games, the Raiju Ultimate’s extra button placement is on point. There are two paddles that are bound to L2 and R2 by default, as well as buttons next to L1 and R1 that are natively set to mirror those buttons. The paddles take a bit of getting used to because you may accidentally press them when you hold the controller in one hand (to stretch that other hand out and make sure you aren’t developing Carpel Tunnel at 22) but they’re in a very natural spot on the controller for when you hold it regularly. The L1 and R1 button additions are fantastic. Their surface area is small, but it’s the perfect size to be able to press with the very top of your index fingers. It feels as though Razer has placed these buttons so perfectly that, without changing the way you grip the controller, you’ve now got access to two more sets of buttons. Seriously, I didn’t have to reach to be able to press them ever and that felt like the level of “elite” I want in a third-party controller. 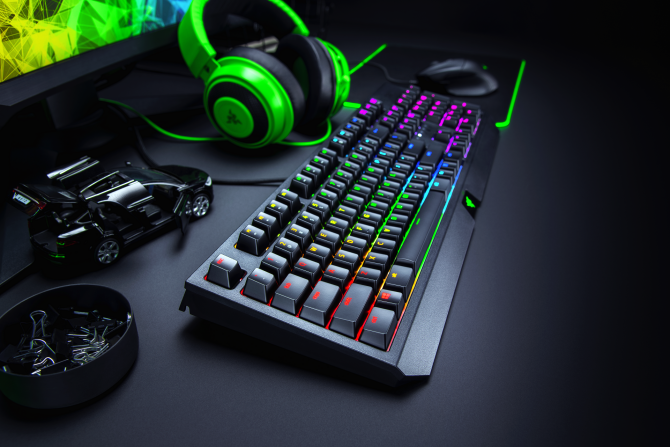 Even the buttons feel “elite.” Razer claims they are the first in the world to incorporate what they’re calling “Mecha-Tactile Action Buttons” (not as catchy as Razer Synapse). These are mechanical face buttons on a console controller. As someone who has used a mechanical keyboard for years on PC, that “click” that occurs when the button is pressed just the right amount is hard-wired into my brain to tell me I’ve actually pressed it. The sensory feedback you get is reassuring so you might not be able to lean on it as an excuse when you get wrecked in Tekken or Soul Caliber VI. Of course, the d-pad button is hot-swappable with a one-button design d-pad, and the sticks can be changed out for taller ones if you need a wider range of motion. Speaking of polish, all of the Raiju Ultimate’s customization is accessible through an app on your phone. I was never really good at inputting cheat codes into my controller, so the added option of being able to change settings on a touchscreen feels like that extra layer of quality I was looking for to justify this controller’s price tag. 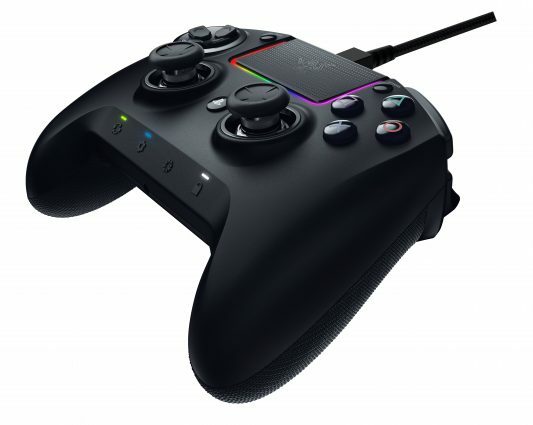 Aesthetically, the Raiju Elite just looks like a hulking black mass of expensive tech. It’s finish definitely screams “gamer,” but it’s not as pretty as the Xbox One Elite controller, even with Chroma. That’s okay though because it’ll be in your hand most of the time. It’s weighty and sturdy, which are the pillars of any “elite” controller option. Against my better judgment, I did a drop test to see how much of a beating these things could take and the results were (thankfully) what I was expecting. Dropping the controller from 4 feet up, or where you would normally hold it if you’re on a couch or chair had no effect on the connectivity, or even the interchangeable buttons falling out (as has been the Humpty Dumpty nightmare I’ve dealt with on the Xbox Elite controller). Dropping it from any higher than that did result in a temporary loss of connection, but all I had to do was press the PlayStation button to get back in. I’m not going to drop this thing off of any balcony, but for extreme use (for those of us who have trouble managing our anger) this controller will suit you. The controller comes with a 12-month warranty. 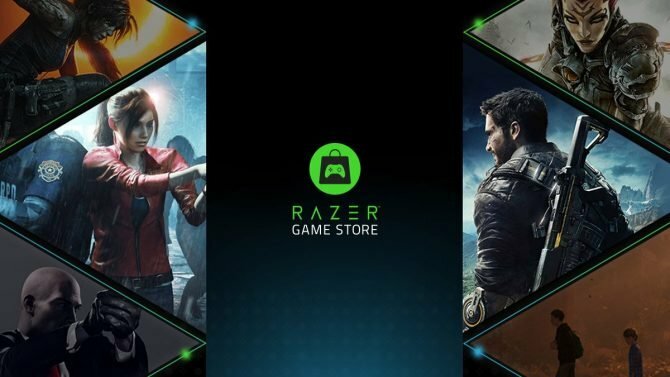 Razer has gotten flak in the past for not holding to the industry-standard two-year warranty on computer hardware like mice and keyboards, but 12 months for a controller feels right. It’s the only peripheral you’re using when you game, so it’s going to see more wear and tear than any one PC peripheral would. It’s also got a carrying case (which looks oddly similar to the Xbox Elite controller’s) so you’ll treat it well on longer trips. Ultimately,the Raiju Ultimate needs to, for me at least, justify the extra $50 it has over the Xbox Elite controller. I understand that these two controllers aren’t competitors necessarily, but Microsoft has spoken on what it considers to be an “elite” controller at a $150 price point. The Raiju Ultimate will run you $200. For that $50 you’ll find that you actually get a lot more out of this piece of tech. The customization options are right there on the controller and don’t require you to go onto your console or PC to change them. You could even use the app which was designed specifically for the Raiju and finally, the placement of the additional buttons and the introduction of mechanical buttons to the D-pad and face buttons makes you feel like you’re holding a really expensive product. So if you do decide that you need a much better version of a DualShock 4 (no relation) the Raiju Ultimate makes for an excellent choice.